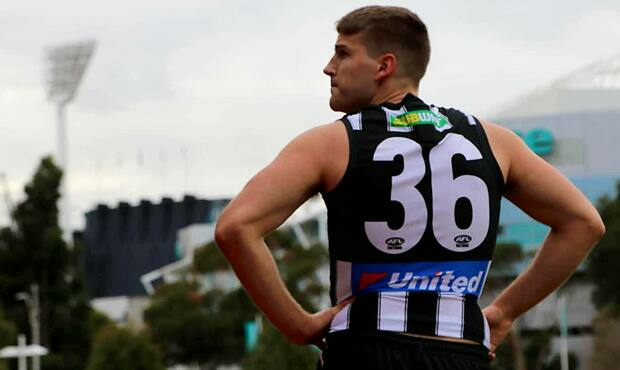 Brayden Sier watches on during Collingwood's loss to the Northern Blues. Photo: Collingwood Media. Collingwood VFL coach Jared Rivers says his side was out-worked by a hungrier Northern Blues side in its four-point loss at the Holden Centre on Sunday. Rivers repeatedly used the word ‘intent’ when he spoke with Collingwood Media after the game. He pinpointed his side’s deficiency in that area in relation to their opponents as the reason for the defeat. “Credit to Northern, they brought the right energy and intent for four quarters,” Rivers said. “We had a focus on starting the game well and we just didn’t rock up. That’s really frustrating from my point of view. “We knew what to expect and we just didn’t show enough intent ourselves to have a crack at it. The slow start which Rivers refers to meant that the Magpies were playing from behind from the early stages. The Pies conceded five of the first six goals to trail by 19 points after the first term. A drastically improved Collingwood came out of the quarter-time huddle. The team got back to the contested style of footy that has been the hallmark of the first half of its season. Ben Crocker was the main beneficiary as he booted three of his five goals in the second term, spending most of the quarter in a new role as the deepest forward. The use of a smaller forward line was effective at times for the Pies, but ultimately Crocker and Andrew Gallucci didn’t see enough of the ball inside-50 to kick a winning score. Rivers says that poor decisions made by his team in moving the ball starved his forwards of opportunities. “We were trying to play too quick. We tried to get it to our forwards one v one but just couldn’t do it enough,” Rivers said. The Pies must regroup quickly ahead of a trip to Burbank Oval next week to face Williamstown. Rivers acknowledges that a much-improved performance will be required if his team are to return to the winner’s list. Williamstown away has proven to be a tough fixture for the Pies, as they have never won at the ground. The Pies will have the chance to break the hoodoo on Sunday at 2.00pm. The VFL Magpies received plenty of support from the Black and White army at the Holden Centre. Photo: Collingwood Media.